Expansion of industrial vertical owing to the government's National Development Plan 2016-2020, progression in construction sector and redevelopment of infrastructure would fuel the growth of Ivory Coast UPS market in the coming years. Additionally, development of IT & telecom sector and rising number of small and medium-sized businesses would also create the demand for UPS systems in the country. By regions, southern region captured the largest revenue share followed by northern region and is anticipated to maintain its dominance in the coming years due to the upcoming metro and rail projects in Abidjan region and moreover with the construction of new stadiums would require installation of new UPS systems in the region. 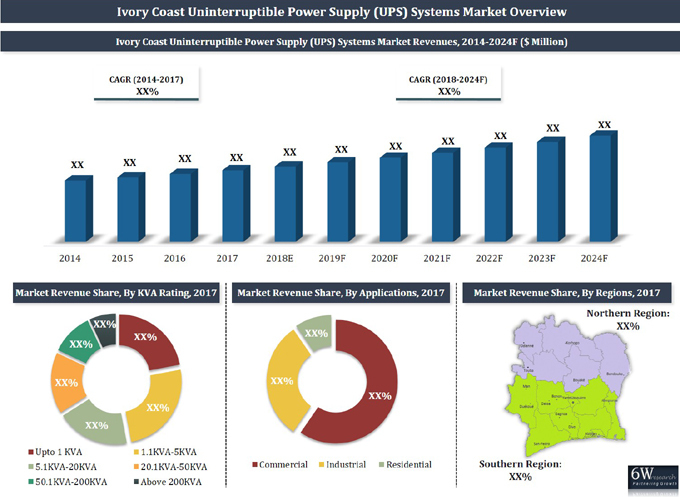 The Ivory Coast UPS market report thoroughly covers the market by KVA rating, applications and regions. The Ivory Coast UPS market outlook report provides an unbiased and detailed analysis of the Ivory Coast UPS market trends, opportunities/high growth areas, market drivers which would help the stakeholders to device and align their market strategies according to the current and future market dynamics.